After I came back from my adrenal burnout and won the Swedish Championship 2009 at the Ironman distance and set a new course record so began the questions rolling into how this was possible to do. 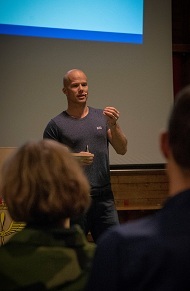 This, together with what I have done earlier in my career was the start of my lecturing that has evolved to I lecture on both kickoffs and training days with companies where I talk the importance of goals and a life in balance, and sports clubs how to get the very best out of one without negative health effects. I believe that I have topics that concern all of us who want a little more in life, whether it is intended to develop as athletes, entrepreneurs or private. So are you interested to learn more about how it is to be a pro triathlet? To set goals, manage stress, balance in life, the risk of adrenal burnout. Please don't hesitate to contact me.